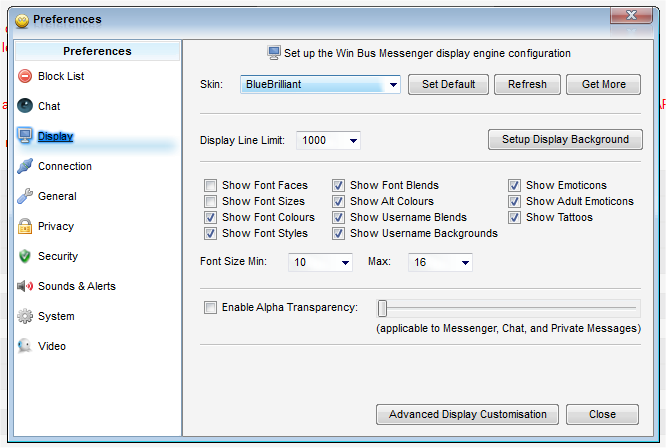 Adjusting your display Preferences is made simple by Win Bus Messenger's intuitive and easy to use Preferences dialog. Here you can see a whole range of options. Let's break those down. At the top, you have your skin - this is the skin for the entire Win Bus Messenger program. You can rapidly change the entire look of the entire program by modifying this, and if you feel the skins packaged with the initial installation aren't for you and you need more options, get Get More, then Refresh once they've been downloaded and installed for you automatically! The set default button returns you back to the skin Win Bus Messenger is shipped with by default. Next we have Display Line Limit, here you can set how many lines buffer up in your chat window for you to scroll up and read back, ideally this value will be kept low, but for those who love to be able to scroll up and be nosey, feel free to increase this setting, but please err on the side of caution where possible as the higher the value, the more resources the program will use! You can also click the Setup Display Background button here, to be presented with a dialog exclusively designed for adjusting how your chat window looks. Below is a whole number of tick boxes! Woahhhh so many.. actually they aren't too complicated. The labels on each are pretty self explanatory, some people love to see your rainbow colour fonts but their eyes just don't gel well with massive or small font sizes, so they may wish to prevent custom font sizes, for example. The same applies to all of these "Show .." tick boxes. The font size minimum and maximum can be set to prevent wildly small or large fonts to your hearts content. Below we have "Enable Alpha Transparency", this will allow you to make the whole program partially "see through", this is really just a fancy graphical effect, with the bar to the right of it geared to adjust just HOW "see through" it goes. Further down we have the Advanced Display Customisation button. In there you can adjust default colours and textual values used to indicate users coming or going from chat, or their username if they aren't using custom colour blends, as well as the default font which will become important if you disable certain attributes in the above "Show .." tick boxes, as it will automatically inherit those attributes from your "Default Font". Simply click a label in that dialog to be prompted with a small font window, to adjust them on the fly. That's it for the Display Preferences. Enjoy!